1. Last Tuesday evening – February 9th – the Wisconsin State Senate passed, along partisan lines, hyper-partisan legislation – Senate Bill 295 – which eliminates the ability of organizations like the League of Women Voters, the NAACP, Voces del la Frontera and even city and municipal clerks to be able to conduct effective voter registration drives. The measure also stipulates that mailed absentee ballots not received by election day will not be counted. Currently, absentee ballots that have a postmark on Election Day are counted. So that means thousands of absentee ballots will be disqualified! While SB 295 does provide for some online voter registration – a positive thing – the obvious hyper-partisan voter suppression provisions (added in secret and without a public hearing) render this legislation utterly unsupportable. Both State Senator Devin LeMahieu (R-Oostburg), the primary author of this abomination, and State Senate Majority Leader Scott Fitzgerald (R-Juneau,) were both incapable of being able to defend the legislation during the floor debate last week and simply called for partisan votes to defeat Democratic amendments that would have improved the bill. A number of Democratic State Senators were outstanding in their determined assault on this obviously hyper-partisan voter suppression measure: Julie Lassa of Stevens Point, Tim Carpenter of Milwaukee, Mark Miller of Monona, Jon Erpenbach of Middleton, Fred Risser of Madison, Chris Larson of Milwaukee, Janet Bewley of Ashland and Dave Hansen of Green Bay. The Assembly is scheduled to vote on Senate Bill 295 tomorrow, Tuesday – February 16th – and it is vitally important that you contact your State Representatives and inform them of your opposition to this legislation in its current form. One critical reason to do so is to build the public record in opposition to this and other anti-democratic legislation, as was done last Fall when the GOP destroyed the non-partisan Government Accountability Board and transformed Wisconsin's campaign finance laws into among the very weakest and most susceptible to corruption in the nation. Real citizens do not support this stuff – special interest-controlled politicians do. If you do not know who your State Representative is, go here. To find out more about this measure and why CC/WI does not support it – and why you need to oppose it, too, go here, here, here, here and here. 2. This past Friday, the Wisconsin State Journal issued this powerful editorial demanding that Republican State Rep. Kathleen Bernier of Lake Halle, the chair of the Assembly Campaign & Elections Committee, fulfill her commitment to Common Cause in Wisconsin to hold a simple public hearing on legislation – Assembly Bill 328 – that would establish a non-partisan redistricting process (similar to Iowa's) in Wisconsin for 2021 and end partisan gerrymandering, which is a significant reason why our elections are rigged. We know both she and the GOP leadership oppose fair maps for legislative and congressional districts. But they owe the citizens of Wisconsin at least a public hearing on the issue where both sides can make their case. Read the editorial and then contact Bernier and demand that she schedule a public hearing on Assembly Bill 328! Her email is Rep.Bernier@legis.wisconsin.gov and her office phone # is 608/266-9172 or 888-534-0068. Make your voice heard! Additionally – if you have not already done so, please sign our on-line petition in support of non-partisan redistricting reform, specifically the "Iowa-model" legislation, so that we can demonstrate to legislators the very broad-based citizen support for ending hyper-partisan gerrymandering that robs Wisconsinites of genuine choices at election time. If you have already signed the petition, please forward this to friends and urge that they do so as well! Our goal is to get up to 2,000 signatures by the time the Wisconsin Legislature adjourns for the year in March. Thanks! 3. 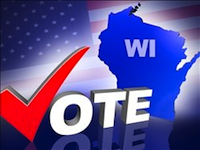 Former State Senator Tim Cullen of Janesville, who served from 1975 to 1987, and then again from 2011 to 2015, has recently been elected to the Common Cause in Wisconsin State Governing Board. Cullen was a leading proponent of political reform issues during his most recent stint in the Legislature and in particular, on the issue of ending partisan gerrymandering. Working closely with former State Senate Dale Schultz (R-Richland Center) and State Senator Dave Hansen (D-Green Bay) and with CC/WI, Cullen helped make redistricting reform and fair voting maps a front and center issue in Wisconsin during his tenure. Tim also served on the CC/WI Board from 2008 to 2010 before running for the State Senate. Tim recently published a "must read" book about Wisconsin politics and how it has changed (for the worse), particularly over the past five years. 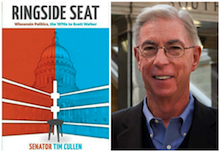 We highly recommend that you order and read Ringside Seat to understand where we are in Wisconsin politics and how we got here. Any profits from the book sale go to charity – not to Tim or to CC/WI. Tim joins these other dedicated Wisconsinites dedicated to honest, clean, good government who currently serve as members of the CC/WI State Governing Board: Naomi Gunderson Bodway of Osseo, Mike Drew of Shorewood, Tom Frazier of Verona, Luke Fuszard of Middleton, Bill Kraus of Madison (Chair), David O. Martin of Muscoda, E. Michael McCann of Milwaukee, Cal Potter of Sheboygan Falls, Kelda Helen Roys of Madison, Penny Bernard Schaber of Appleton, Bob Schweder of Princeton, Fred Trost of Elkhart Lake, Roger Utnehmer of Sturgeon Bay and Dirk Zylman of Sheboygan. Fatally-Flawed, Hyper-Partisan Online Voter Registration Measure to Get Vote in Assembly TuesdayTweet this!